This can be used inside the computer. 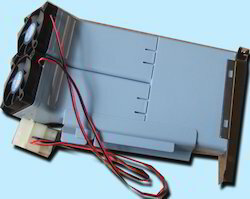 It sits on an expansion slot (not electrically connected to the slot) and can be used either to pull in cool air or push out hot air. Prime Source Technologies Pvt Ltd. Is one of the leaders in bringing you premium quality computer cases, power supplies, storage products and related accessories. Established in 1994, we are one of the oldest players in this field. We ensure that we pick and choose only the best items in their respective classes, so as to ensure that the users get the best value for their money. One of our key specialities is that we provide customized solutions relating to our domain. We are located at Chennai, in South India, which is one of the premier ports in the country with lot of shipping and air links to Southeast Asia and other key supply zones. We are also well connected by road, rail and air, within the country.